My role with the Uniroos is to be there to support them. To understand what they are going through. To share stories of the various experiences I had during three Olympic campaigns. I’ll be there with the athletes to listen to what they’re going through, to inspire them to be their best and to help them deal with nerves, fears or doubts. This will be done by attending meetings with them, participating in team discussions when appropriate, by encouraging a big team feel, eating meals with them, travelling to and from training and events, being there to cheer them on when they win and be a shoulder to lean on when things aren’t going so well. Kind of like a “mum” with the experience that you don’t yet have! 2. As Peak Performance Mentor, how have you adjusted to a role away from the court, and on the sidelines helping other Uniroos staff? I’ve always loved coaching and helping others, so it was always on the cards that when I was done playing, after 22 years of representing Australia, that I would give back within my sport and with other athletes. That’s why I decided to write a book called The Business of Being an Athlete. It’s all about how you create a career around your sport and also to be the best at your sport. 3. What degree of fitness and preparation is important for competitions of extended duration and of elite standard? Wow, that’s a tough question to answer, as each sport is different. Basically, these days, if you want to compete at the highest level in the world, you have to be a full time athlete. And, you need to be able to train harder and longer than any event would take and then (in the case of the beach volleyball players on the World Tour) be able to back it up, week after week for up to 12 weeks during the season. Getting to this fitness level takes very specific training, which is overseen by experienced conditioning coaches, in combination with the sports coach. Recovery is also extremely important to enable you to back up, time and time again. 4. At the recent Uniroos conference in Queensland, what were some of the key points you spoke about? Passion, Preparation and Belief – my three keys to success. To be successful in anything, you’ve got to love what you do. The passion that you feel for your sport or your career should get you out of bed each morning with a burning desire to improve. Preparation is all about the hard work. The specific physical training, skills training, game situation training and most definitely, mindset training. And finally, belief in yourself, belief in your team and belief in the journey is the last piece of the puzzle that brings it all together. Belief is not built overnight. It’s something that you work on while you’re DOING all the hard work, but also from exercises you can do OFF the field or court. Building belief is the most important key to success. 5. Less than ideal playing conditions are an obstacle athletes must overcome during the Universiade. 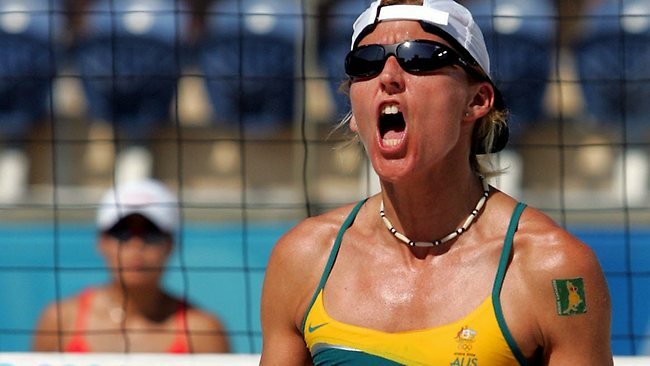 Having played beach volleyball in sometimes uncomfortable heat, what will be the most important aspect to help athletes prepare and stay match fit? Athletes need to be thinking about what these conditions will be. They will need to be prepared for the heat, the crowds, the different types of food and even the different environment. Research is key and preparation for these conditions is vital. For instance, in hot conditions, icepacks, cold and wet towels, water and specific sports drinks will be necessary. Clothing for ALL sorts of conditions is also crucial. You can never tell with weather these days. It’s better to be prepared! 6. At the coal face, what is the most significant message that should be passed on to athletes from the leadership groups or coaches? I think it’s important for us to all give UNWAVERING SUPPORT, no matter what the results. It’s nerve racking enough for athletes to compete in this type of competition. Positive, motivational, uplifting and FUN communication is my aim. 7. Australia’s men’s volleyball team won three out of eight matches in Kazan 2013, and finished 11th in China 2011. Have you seen the 2015 team in action, and if so, how do you think they will perform? I haven’t seen the exact team yet, but what I hear about them is great. The Australian national team is doing so well in the World League against the best teams in the world, so I’m sure this is inspiring the guys in the Uniroos volleyball team. I’ll be there to cheer them on and to inspire them to do their best. 8. What key tactics are at play in forming both good defensive and offensive strategies for the six on-court players in volleyball? Another great question that requires very specific answers. But, basically, as in any sport – great communication from the play maker and his star players, (the setter in volleyball who communicates with the spikers.) Offense in Volleyball is driven strongly by the quality of the serve reception. If the reception is close to the net, just off centre to the right, then the setter has at least four options of whom he/she can set. This makes it extremely hard for the opposition to know who will get the ball and who to block. Each team has their own systems, so scouting your opposition before matches is crucial. 9. The memories and friends made at a sporting competition last forever. What do you remember most about your time in Australian colours? I most definitely remember my friends. I have very strong friendships still, after being retired for over 10 years, with players from all over the globe. I was quite a social player and enjoyed spending time with others and trying to learn their languages. Many of the players I played against now have families, as I do, and we still communicate via social media. That is one advantage so many athletes have these days – social media. I see it as a benefit, rather than a distraction and I will be encouraging athletes to use it to publicise their journey, while taking care not to over do it and let it distract them.